A fascinating renewal of the £100,000 G2 BetBright Trial Cotswold Chase saw success for 7/1 chance Definitly Red, owned by Phil Martin and James Keegan, trained by Brian Ellison in North Yorkshire and ridden by Danny Cook. The improving nine-year-old chaser will now go straight to the G1 Timico Cheltenham Gold Cup on the fourth and final day of The Festival, Friday, March 16. He won in good style by eight lengths from American (Harry Fry/Noel Fehily, 9/2), who does not have a Cheltenham Gold Cup entry but might be supplemented if the ground stays soft according to trainer Harry Fry. Bristol De Mai (Nigel Twiston-Davies/Daryl Jacob), the 7/4 favourite, came home third, two and a quarter lengths further back, disappointing connections, who will now enter him in the Randox Health Grand National, which closes on Tuesday. He might miss the Timico Cheltenham Gold Cup. Brian Ellison commented: "It has been ages since I had a winner here - Latalomne was the last one in 2001- but you have to have a good horse to come here and Definitly Red is probably the best that I have ever trained. It's a good place to have a winner! "Danny (Cook) gets on great with the horse and gave him a great ride - he is probably one of the best jockeys riding around. "He had to use his head down the back, when he was sitting upsides American, who was jumping that bit better than us. Danny sat off him by two lengths and, when he had given Definitly Red a kick in the belly, he has gone. "There was plenty of pace on and they never let up in this ground. He shows that he stays well and it's the Gold Cup now. He doesn't need this ground, he has won on good ground, and he just doesn't like it tacky because he is such a good-moving horse. "He has got better every year and the plan this season was to keep him fresh. Today was the day when we decided whether to go for the Gold Cup, so we will go there now." Danny Cook declared: "Definitly Red is a horse that always goes under the radar. You only have to look at his runs to wins ratio - he is now 12 wins from 23 races, so he is above 50 per cent. "He is a fantastic horse for me to ride and I have been very lucky with very loyal owners and trainer. Hopefully, I can keep repaying their faith with winners. "We have gone a good gallop. American has gone pretty keen and fresh, so we have followed him through when he came up the inside. I was quite glad for a bit of company to be honest because Definitly Red would have idled the whole way if I had got to the front. "I got a nice tow and, when I have asked my horse turning in, he has really quickened up well. He has idled after the last but, if something was with me, he would have found more. "He is not pretty to look and not overly big, but he is the one you all love to have. He does nothing quickly up the gallops and what you see is what you get. He performs on the racedays - he does no flash work but just keeps going. "I will enjoy today and have a few drinks tonight because I don't get to ride these ones that much round here. What will be in the future will be and we will enjoy today for now. "I'd like to dedicate it to my grandad, who is not very well and I don't know how much longer he has got. He asked if I could get a big one at Cheltenham and I am glad that I have." Harry Fry said of American: "If you had told us at the start of the day that we would finish second, we would have taken all day long. For the first couple of fences, it looked like a repeat of Newbury - he wasn't really jumping, travelling or giving Noel much of a feel - but he warmed to it and really got into a rhythm. "For a minute at the top of the hill, we were almost thinking that the impossible was going to happen. We came here today thinking that it possibly be his last run this season because he hasn't been showing us masses at home. "Hopefully, today he has got his mojo back and he revelled in those conditions. We have just got to find the same conditions and I am delighted to have a horse back on our hands. "He is not entered in any Cheltenham race at the moment and he needs these conditions. The likelihood of that at The Festival is slim, but we won't rule it out and we can always supplement if we need to. I would have thought that it was unlikely and there is a Listed chase at Kelso at the beginning of March, where he might get his ground." Headed to Aintree for the Randox Health Grand National is the fourth home The Last Samuri (Kim Bailey/David Bass 9/2), runner-up in the marathon in 2016, who nearly snatched third today. His trainer Kim Bailey said: "I am delighted with The Last Samuri. He has never been to Cheltenham before and is a good ground horse, but he has tried his heart out and ran a proper race. "It was a proper Grand National trial - all he was doing was staying at the end - and I think that he will go straight from here to Aintree where, fingers crossed, he will have a great chance. "He has run in God knows how many races at Aintree and won and placed at Doncaster, but he has been running with top-weight every single time he runs. There was an idea that the Gold Cup was cutting up a bit and we had to have a try and see. "If anything, he has proved today that he is not good enough to go and do it in the Gold Cup. 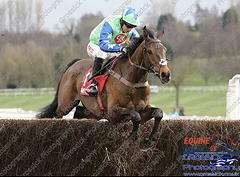 He is still a very good horse and Aintree is more his course - he is such a fantastic jumper and I am delighted with him."